Let’s be crystal clear at the outset. Only One can claim to have been betrayed by a close comrade, arrested, found guilty at three separate rigged trials, beaten, brutally whipped/scourged, mocked, marched off on public streets, crucified, died, and was buried in a borrowed grave for our sins on a Friday that’s paradoxically called Good. Only One can claim to have undergone all of that, and then rise from the dead. And if experts who’ve long studied the Shroud of Turin and the Sudarium of Oviedo are correct, that One left strong evidence that’s inspired billions of souls throughout the centuries ever since. Respectful of our weak yet free will that He died for, Jesus of Nazareth beckons us to look anew, and apply what happened almost 2000 years ago to our own time, and our own circumstances. Let’s do so, and apply that Way to our often troubled profession. “Take up your cross, and follow Me,” Jesus said. Surely at first blush, those words ranks as the worst sounding invitation of all time. So why did so many in that era take those striking words literally? When thousands were likewise sentenced to their own cruel deaths by Roman authorities, and by the politicos and hired thugs of their time? …only to return more humbly again. After all, we are sinners. It’s the one thing that Saul – who originally persecuted believers, and who became the Paul that preached what he had first disdained – said we have in common. 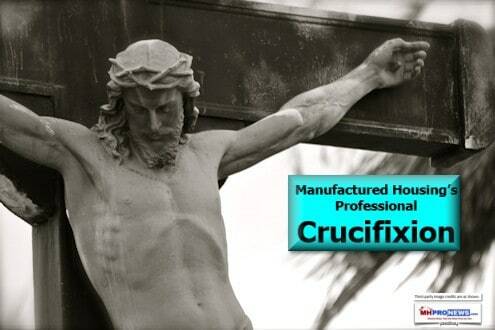 Through the lens of Good Friday, let’s look at Manufactured Housing’s own crucifixion. Day by day, our industry is mocked in the media. Manufactured homes are a political football that’s kicked and passed around, fumbled, sold out for thirty pieces of silver, and often frustrated by forces seemingly larger than the 22 million now being served. No wonder it’s ignored by so many, when it commonly goes under false names like “trailer house,” or dated terms like “mobile home,” even though no new mobile homes have been shipped in the U.S. since the first manufactured homes were built on June 15, 1976. At Christmas, believers heard and read that Jesus was born in a stable, exiled outside of town. It was the social outcasts of that era – the shepherds – who heard the herald angels sing; not the rich, famous, or powerful. While some brave souls with millions in net worth own manufactured homes, many more shun them, just because of the unfair rep.
And that’s just fine for scores of locals and so called leaders scattered across our land. Is it better to have half a million homeless? Is it better to have tens of millions locked in poverty? Why not consider the obvious solution? The one hiding in plain sight? …or so the deeds of the short sighted, ignorant, lazy, greedy or corrupt would have millions think. Never doubt that forces favoring and profiting from subsidized rental housing resists the obvious solution of manufactured homes. Last week, HUD Secretary Ben Carson – world renowned for his achievements in medicine – was mocked by some in politics and the media too. Like the president, vice president, cabinet, administration and the American people they serve, they too are all being sold out at every opportunity. Sometimes that betrayal is by those who are supposedly in their own party, and among their supporters. No wonder so many of us won’t take the label of Democrat or Republican. Like Judas Iscariot, the news often gives more attention to the behavior of the wicked, than to the behavior of the those trying to do good. Spotlight some embarrassing incident, no matter how long ago, or regardless of how irrelevant to the important job at hand. Secretary Carson, teed up by a question from Senator Thom Tillis (R-NC), talked about how “Amazing” today’s manufactured homes are. Carson called many of the regulations of manufactured homes “ridiculous.” You don’t have to be a brain surgeon to see the truth that what you build indoors in a production center will cost you less than the same thing built outdoors on scattered locations. Save time, buy materials in bulk, cut wasted and stolen items down, save labor, and you’ll save money. That’s why Secretary Carson could honestly say that manufactured homes often look like and rival conventional housing, and cost less. Per the U.S. Census Bureau, they are about half the cost per square foot as site building. There’s an important part of the solution to the affordable housing crisis, as Carson himself observed. So why aren’t manufactured homes embraced? One might as well ask, why don’t all embrace the cross of Christ? 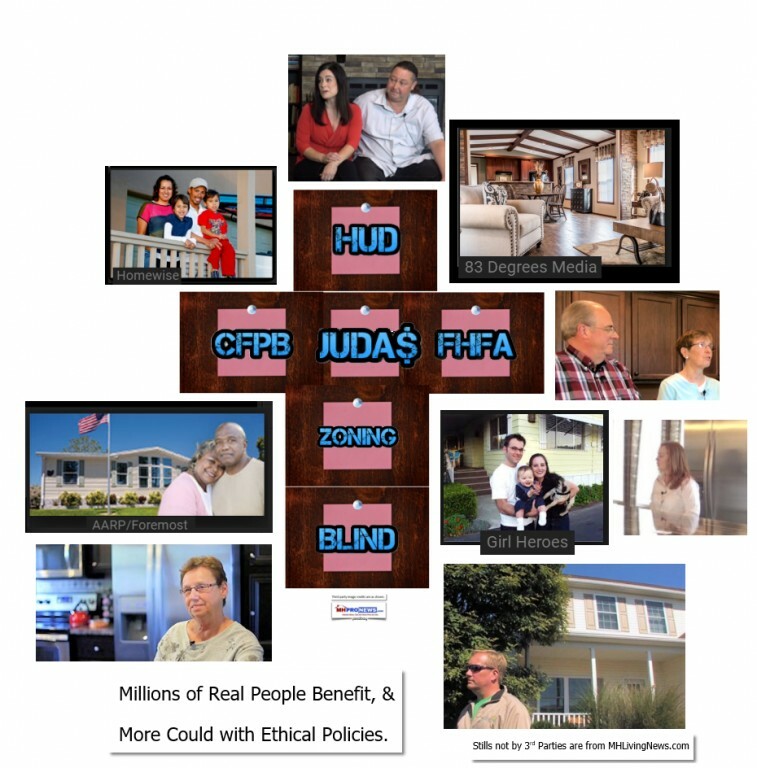 We will link up below the betrayal of manufactured homes by people, who like Judas, sold the industry out so that they could play the corrupt game in the temple that the money changers did in Jesus’ time. But those corrupt industry folks, who are building “a moat” to enrich the few to the harm to the many, have been killing off competitors by an abuse of economic and political power. Like Pilate or his brutal soldiers, they have various kinds of blood on their hands. Some historians claim Pilate converted later in his life. Some say, some of Pilate’s soldiers and executioners did too. If it’s possible then, it is possible now too. It took the most grueling and unjust death of all time to bring about the conversion of so many souls over the ages. It took Dieced – the killing of the God who become Man – to win victory over Satan. That’s what made this Friday, Good. We can’t be surprised if we too have a unique cross to take up too. On the other side of the darkness of Good Friday, comes the bright sunrise of Easter Sunday. Manufactured housing has been crucified for years. It was buried in certain ways by some, including those who falsely claim to be the industry’s allies. Pilate and the authorities spread lies to cover their tracks after they killed the Christ, too. Might our misunderstood and maligned profession – given Secretary Carson’s and the Trump Administration’s leadership, and enough people of good will across the left-right political divide – support as needed our industry’s much needed rebirth? Will the needs of the many outweigh in time the blindness and greed of the few? If enough do the politically incorrect in our time, then Senator Tillis’ and Dr. Carson’s insights will prove to be wise. In turn, millions more will be served, and can lead a better life.